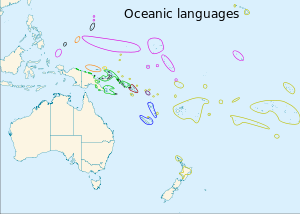 The black ovals at the northwestern limit of Micronesia are the Sunda–Sulawesi languages called پلاؤی زبان and Chamorro. The black circles in with the green are offshore پاپوائی زبانیں. Ross, Malcolm and Åshild Næss (2007). "An Oceanic Origin for Äiwoo, the Language of the Reef Islands?". Oceanic Linguistics 46: 456–498. doi:10.1353/ol.2008.0003.